SN1 SN2 E1 E2 comprise the most difficult set of reactions you’ll learn in organic chemistry. The reactions themselves are simple enough but choosing which ones to use when can be tricky. This video will give you a quick overview/review of the individual reactions and mechanisms to prepare you for the detailed tutorials on how to logically choose between these reactions. 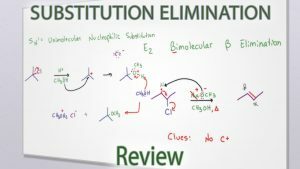 This is Video 2 in the Nucleophilic Substitution and Beta Elimination Video Series. Click HERE for the entire series. Leah you explain these reactions so well! Sometimes it seems simple to memorize what SN1 and SN2 reactions are until you get questions on these and realize that you don’t actually understand it as well as you think! Thanks for making these reactions understandable!!! !